When it comes to creativity, popular culture can offer a picture of gifted people being inspired and followed by a swoosh of activity to produce what they have in mind. Thinking it doesn’t quite look this for us, we don’t follow the ideas we have and the energies we feel. We see the product but not the process of blood, sweat, and tears. When we give ourselves to the graft of process something very beautiful can emerge. What if this were a picture of our lives, a museum of rooms containing missed opportunities for living out the things we have dreamed about? What if, instead of creating perfect little models of what would have to be to begin, we go ahead and create the real thing in some little and imperfect and incomplete way? Whoever it is who inspires you, behind the products of their creativity will be found sweat, desperation, blank expressions, frantic activity, all contributing to the process which eventually ends in some scrubbed, highly coloured and glossy, boxed something or other. Every morning, I get up early, hide myself away to read and reflect and journal: paper and fountain pen, trying not to come to conclusions, trying to let whatever may come emerge from the spaces between many books and scripts and thoughts. Then, before the urgent things of the day, I force myself to write some extract and abstract into a “new post” for my blog. I press the save button and walk away to begin thinking about some cartoon to accompany it, gt on with other work – emails, “to-do” lists, and then, later in the day, a third attempt to write something, include the cartoon, and press “publish” (which is just a grand word WordPress uses to make me feel better). I have no delusions about what I am doing, it’s simply my challenge not to not do anything. It took me to 54 years of age before realising I need to sweat it to push forward something I love, and each day to repeat. A year ago, I scribbled out the following thought in my “Backlog” (ideas I might come back to). I’m indebted to Hugh Macleod for unknowingly pushing me to blog and cartoon about the stuff I love. John O’Donahue tells the story of a journalist who wanted to interview a native South American chief. Before acceding to this request, the chief asks to have time for the two to be together beforehand. On meeting he begins to stare intently into the journalist’s eyes. At first deeply unnerved, the journalist enters into this deep gazing and for two hours the two look upon each other in silence. The interview then didn’t needed to follow. We are the strangest of animals thrown out by a universe which appears to be accidental in nature: the Human face looks out on the vastness of the universe and ponders the “infinity of interiority” amongst the many infinities of the macroscopic and the microscopic, many worlds and universes. It is perhaps in the coming to see and understand these worlds we find in one another’s lives, we come to see and understand our own life. sometimes meeting across a presence they inhabit together. Marco Polo imagined answering (or Kublai Khan imagined his answer) that the more one was lost in unfamiliar quarters of distant cities, the more one understood the other cities he had crossed to arrive there; and he retraced the stages of his journeys, and he came to know the port from which he had set sail, and the familiar places of his youth, and the surroundings of his home, and the little square of Venice where he gambled as a child. Can it be, in the meeting of many new lives into which we gaze intently, we come to know and understand our own life? If it is so then it is a strange thing, in a universe as cold and indifferent as we believe ours to be, there should be found such shocking warmth and intimacy – hardly yet explored. Many people who’ve had near-death experiences tell of how different life looks like afterwards, how they’re going to make the most of it – the old obstacles won’t get in the way, what people think no longer matters. I was reminded of when I went to swim at a pool – a euphemism for something extremely inelegant on my part – and, not being a very good swimmer, panicked when I couldn’t touch the bottom of the pool. I began floundering but no one noticed; I didn’t want this to be “it” and somehow struggled my way to the edge and pulled myself out of the pool – still no-one had noticed (I like to think someone eventually would have noticed). For some time afterwards everything seemed sweeter. 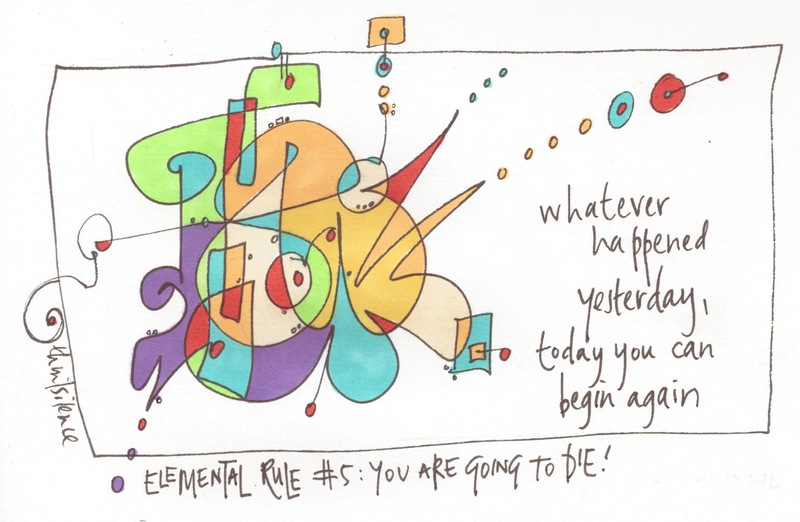 In ancient rites of passage, one of the elementary truths a youngster faced would be: You are going to die. The thinking was, they would face death upfront and then live life fully as a contributing member of their society. We get to live one life; the trick is not to waste it. Whether we read obituaries as a way of having near-death experiences or we write one for our own life,* or we get really focused from the first moment of the day around what it is we must do to make a difference, what if we train ourselves to be life-after-death people who make it possible for others to live again? Who is my song for? it’ll be a dream come true for someone else too. The blanks became spaces for exploration; as it were, spaces to believe in and then to see. 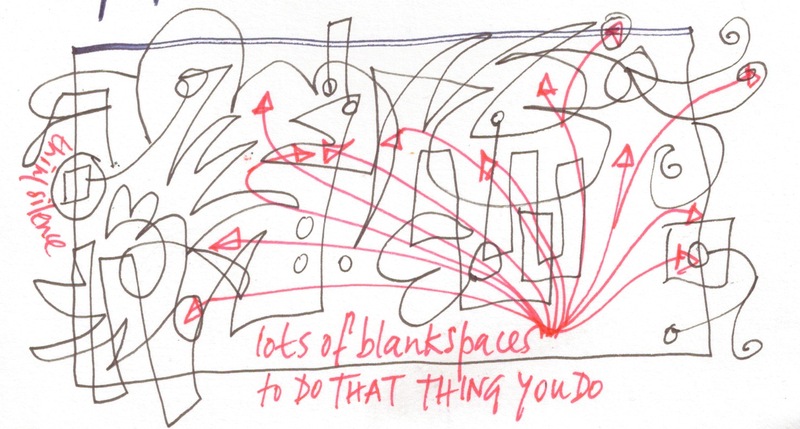 There are in existence more blank spaces than you know, spaces you can explore and make the contribution only you can make, and they may be under your nose, . Between all the things that are happening, because of the efforts and skills of others, there are blank spaces for you to fill with that thing you do. When you believe in them, you will begin to see them. Don’t try and copy what others are doing, then: do what others are not doing. If he’s right then maybe we can turn this around: You love less, you lose? I don’t want to cheapen the context in which these words were spoken, but I think Ahmad is right on many levels. Ahmad is grasping the beauty of the infinite game: to include as many as possible, to keep the game open-ended (who knows where it will take us … and then more), and when the rules threaten to exclude or end the game, change them. To love more, is to be able to love more, is to be able to love more. We’re in need of open-ended games or journeys or story to know more of what we are capable of, and capable of together. Since learning of the Johari window‘s fourth “window-pane” (“Pane 1” – What I know about myself and like to reveal to others; “Pane 2” – What I know about myself but conceal from others; “Pane 3” – What I don’t know about myself but others do know) has intrigued me: What I don’t know about myself and others also don’t know. 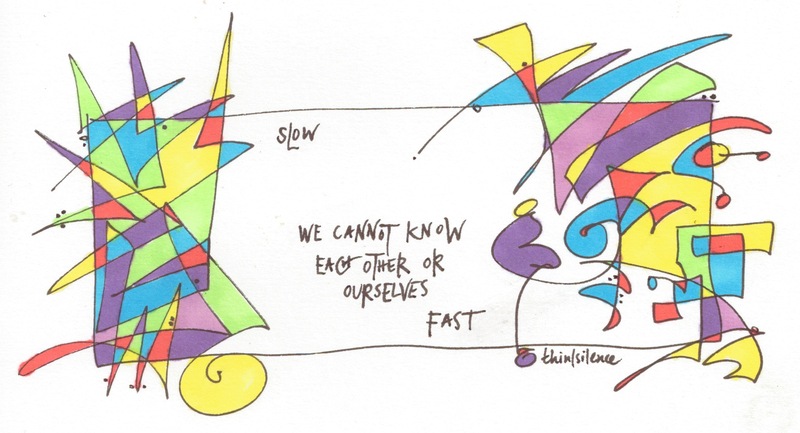 I’m wondering whether these things only begin to emerge through the unfamiliar and the stranger – liminal people and places in which we help and support each other to discover more about one another and ourselves (including our future Self) more – everyone is blind to something about themselves. Our means of venturing into this unknown is often what we love. Here, though, I don’t want to do wrong by Ahmad, but to do more of what you love is to win. 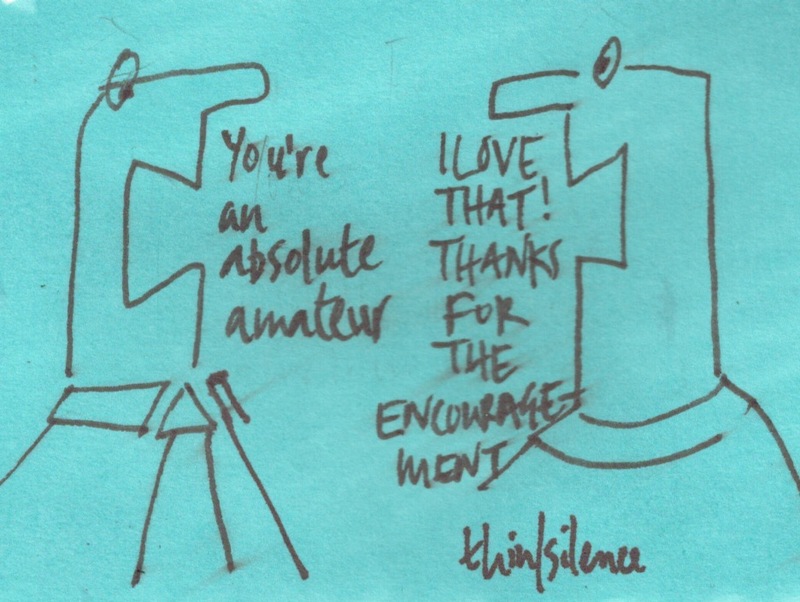 Amateur is French for lover, Austin Kleon‘s definition fitting really well in our infinite game: ‘Because they have little to lose, amateurs are willing to try anything and share the results (David Weinberger comments, ‘The new abundance makes the old abundance look like scarcity’). Amateurs (meaning lovers) are delivering more creatively than professionals (think Steve Jobs, Steve Wozniak, and the Homebrew Computer Club over IBM, or my friend Julie Dodsworth over Royal Doulton, or BrewLab over Starbucks). There has never been a better time for you to pursue what you love. ** Leah Robb’s triangle theory of art suggests craftsmanship, substance, and innovation are important elements for delivering great art – and they’re all available to the amateur in just about any field. The means to develop skills, to connect with others, to deliver what we create has never been so available as now, and everything suggests these will only increase. take a leap. To walk onto the ledge and start. You love more, you win, as Ahmad said. Invisible Cities is Italo Carvelo’s masterful tale of Marco Polo‘s descriptions to Kublae Khan of many cities, gradually revealing the one city he is revealing again and again to be Venice. he brings a particular gift and illumination. We each have something to contribute which another do not. A scenius begins with two people – so you can be the founding mother or father, welcoming and encouraging the contribution of everyone who brings their gift. Then there is yet another story of the city, the place, in which you live. A scenius can be anything from people coming together to explore the idea that everyone has something to share, through to people working on projects in parallel or a project together. Time to tell another story of the city. Whether acknowledged or not, every “genius” of mythical proportion has some kind of scene of people. Scenius requires openness – openness towards ideas, towards others, and towards what we can contribute (action) within, or as a result of, the scene. Another word for openness is awareness: to be aware of what we have been previously blind to. Another word for openness and awareness is presence: open and aware in ways which allow deep connection. The first hurdle is to see and understand there is more than we see and know – we have to suspend our usual ways of seeing and understanding. The second hurdle is to see and understand the Other, through whom we can see and understand more. The third hurdle is to put into action what we are experiencing as change within. Everyone and anyone gets to be included in a scenius, even geniuses – it is an infinite game.